Nahanni has a strong safety record and has built a reputation as a contractor that can work in any environment. Nahanni Construction has worked on a number of projects at BHP’s Ekati Diamond Mine since we first started work on site in 1998. During our time at the mine site, we have had a strong safety record and have built a reputation as a contractor that can work in any environment, at all times of day and night, to get difficult jobs done in a challenging fast paced environment. The Ekati Mine site, located 310 km northeast of Yellowknife, is only accessible by land via seasonal winter road. The site is also subject to the kind of extreme weather conditions the North is known for. Temperatures can drop to as low as -55 degrees Celsius in the winter and rise as high as 30 degrees Celsius in the summer. There were also times when grizzle bears, wolves, and other wildlife wandered onto the site – forcing the temporary shutdown of operations. Nahanni worked with BHP to coordinate shipments to ensure that equipment and supplies were in a place for a year-round construction operation. We also adjusted construction schedules to account for delays caused by weather and wildlife in order to keep the project on schedule. For example, certain projects involving large concrete pours had to be completed during the harsh winter months in order to get the mine up to operating capacity on schedule. Nahanni completed many projects during our time at the Ekati Mine site, including all of the ADHOC work. Most of the major projects were lump sum (hard dollar) contracts that were completed on time and on budget. Some of our work included an underground conveyor system that reached from the bottom of the kimberlite pipe all the way to the mine surface – the first of its kind in the Northwest Territories. We also worked 24 hours a day for six consecutive days to complete a 1,100 cubic m concrete pour reaching depths of seven feet. With so much work happening around the clock, safety concerns were paramount. 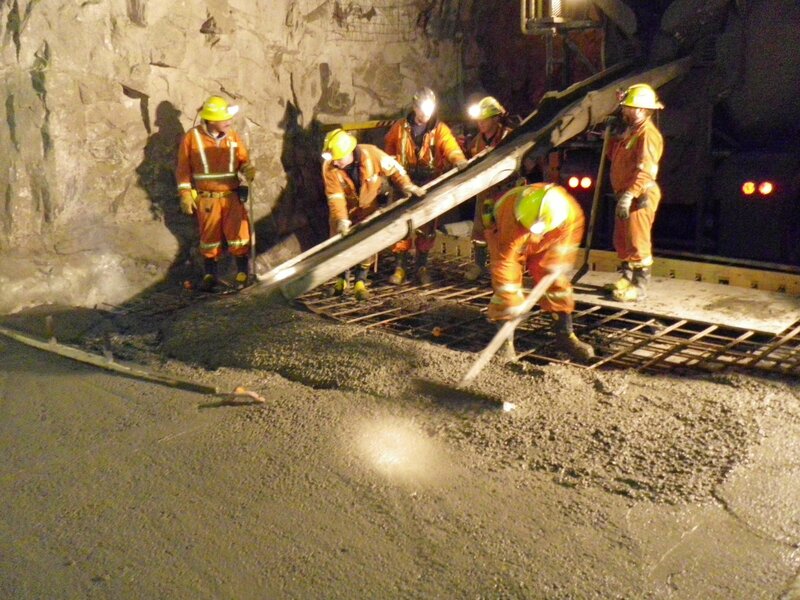 In order to ensure safe concrete operations, Nahanni worked closely with Ekati Diamond Mine to develop a safe operating procedure for full-size concrete trucks in underground situations. Nahanni completed the first underground conveyor in the Northwest Territories. Nahanni has one of the top safety records on site. Nahanni has done all of the ADHOC construction work on the Ekati site. Two Nahanni employees were team members on the Ekati Emergency Response Team and are trained in underground rescue situations.